Impeccability and intimacy go together like organic peanut butter and fresh strawberry jelly. And together they make our relationships more tasty and nutritious. There are two main kinds of communication, and impeccability comes from knowing which type of communication is needed for each situation. One involves clarity, one involves vulnerability. There are many times in our communication with others where we only need to convey facts. To the mechanic: what exact noise our car is making. To the babysitter: what time we will be home and what to fix the kids for dinner. To our co-worker: When they can expect the report and what piece of data we need from them. The best way to share these kind of statements are as simply and as clearly as possible, without added judgment, feelings, or story. In order to be impeccable with factual communication we want to get to the point as clearly and succinctly as possible. These conversations are not about increasing intimacy and connection, but about being present and clear as we convey information. This same state of non-judgmental, open-hearted communication is especially important in our intimate relationships. When we want to increase closeness and connection with another, we need to go beyond simply stating facts to bringing more of ourselves forward in our communication. Last week I watched an amazing demonstration of intimate, vulnerable, impeccable communication. Two of my friends modeled how they found peace with an ongoing conflict in their relationship. And it all started with a willingness to be vulnerable and listen to the other. My friend was upset with her husband because she felt he was not prioritizing a project that was really important to her. They work together, and she had reached a point where she needed him to take the next action. She asked nicely. She demanded. She nagged. She blamed. Nothing seemed to work. She grew more and more frustrated and angry. Still nothing shifted but her level of resentment and her husband’s defensiveness. One day, she took went deeper. Instead of making him wrong, she asked, what am I feeling vulnerable about? This was a first step toward a new impeccability: letting go of blame and judgment, and moving towards a deeper inner truth. She was really passionate about this project. She was also touching an old fear that she wasn’t important, and that what she created was not valued. The next time to talked to her husband, she was able to bring this vulnerability forward without her usual frustration, victimization, and judgment. She briefly shared the tenderness she was feeling, and her strong desire to get the project moving. No longer feeling pushed or blamed, her husband shared his desire to help her, and asked for support navigating his own overwhelm with his current projects. He was able to release his defensiveness in the face of her vulnerable sharing, and stop justifying putting her off. She was able to understand his busyness and his care for her. Together they came up with a new plan about the project that worked for both of them. Most of our attempts to communicate about upset or conflict in our relationships often starts with a distorted perspective: “you are making me feel this way.” While this might seem to be the truth from a feeling point of view, from impeccable language no on can make us feel a certain way; only we have that power. Once you acknowledge that your thoughts are creating your current emotional state, can you go deeper and find what is beneath your creation? Be willing to explore why you are feeling the way you are feeling, and to tell yourself the truth. What I’ve noticed is that I feel impeccable and in alignment with myself when I am not defending, justifying, or excusing my choices and decisions. If I catch I am doing any of these things, I get curious about what else is going on for me that I am not telling myself the truth about or that I am afraid of. This self-intimacy is impeccability in action. And from this impeccable foundation we can then increase our intimacy with others, by letting go of blame and judgment and sharing from our hearts. 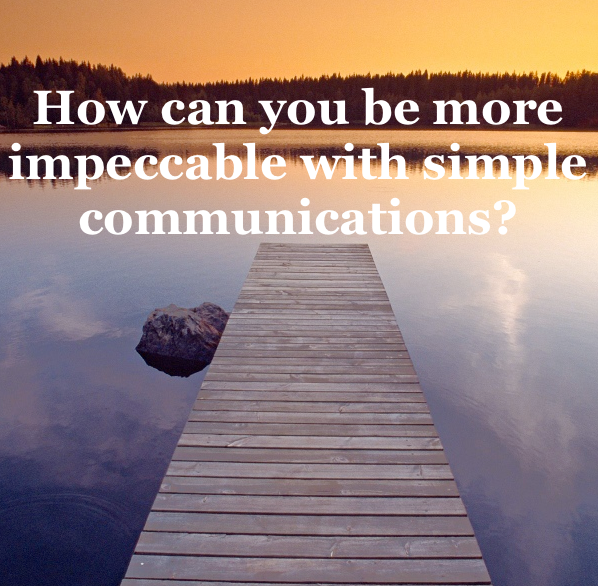 Also explore how you can be more impeccable with simple communications. Share just the facts, be clear as you can, and see if there is more ease in your life!